Philip Mould is a distinguished British art dealer, television personality, and now, author. His book, The Art Detective (Penguin Books, 2009) is totally fascinating and extraordinarily educationalthe reader learns something of great interest on every page. To quote a review in the Minneapolis Star-Tribune, "Mould does an excellent job of bringing the reader into the high-end circles of the art world as we learn about the intricacies of restoration, the importance of provenance, and the nerve-racking pressures of buying at auction... His stories remind us that the world's masterpieces have been, and will continue to be, uncovered in the most unlikely places." Mould includes six stories, involving missing or found paintings by Gainsborough, Rembrandt, Winslow Homer, and Norman Rockwell. Each story is a self-contained adventure, which the reader will find difficult to put down once they are begun. Chapter Three, the account of the famous Norman Rockwell hoax of 2003 is particularly interesting to me, since I am a part of the narrative. Let me hurry to assure author Mould (as I quickly did by email on first discovering his book in the Metropolitan Museum bookstore) that I am flattered to be included in his narrative. I have no illusions, after fifty years painting portraits all across America, regarding my place in the grand fabric of contemporary art. I am a professional practitioner, and I deliver a professional service and product. But Mould is simply wrong on several points, and this is my chance, in a friendly and respectful way, I hopeto point them out. "...family portraits that comfortably slip into the middle-class interior..."
Author Mould has not studied my work. I have never painted anyone (on commission, that I can recall), from the "middle class." My clients are members of the Forbes listing of the "400 richest Americans; the CEOs of the largest banks in the world, presidents of America's greatest universities, senators and cabinet secretaries, and, more recently, the President of the United States and his First Lady. "the myth of modern America." America, in spite of the battering she is taking from her own political leaders, is still a place of initiative and high personal achievement. The men and women who sit for my portraits are high achievers. The portrait is one of their rewards. High achievement in America is not a myth  it is still very real. "will never scare pets or grandchildren." Studying Mould's Internet site, one can see that he is an admirer of the work of Augustus John. I, too, am an admirer of the great English portraitist whose trenchant and probing style was pacesetting. 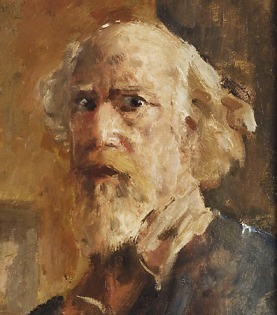 Unfortunately, Augustus John's paintings, if hung in a Manhattan portrait gallery today, would definitely scare away potential clients, to say nothing of pets and grandchildren. 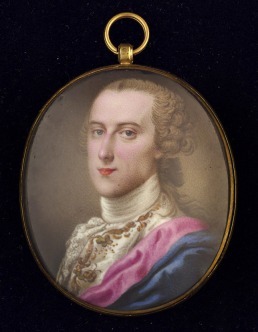 Philip Mould's highest admiration is reserved for Thomas Gainsborough (1727-1788). Gainsborough is generally regarded as the greatest English portraitist of the eighteenth century. However, trenchancy and deep-probing character delineation was not his strong suit. 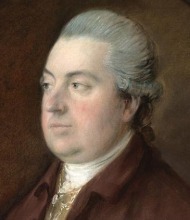 His Portrait of Francis Bennett (below) is about as bland as a portrait can be. Almost any modern portrait, with a modicum of realism, when placed alongside, reveals that, whatever the glorious elegance and style of the Gainsborough grand manner, the man in the painting (Francis Bennett) is not a real human being. 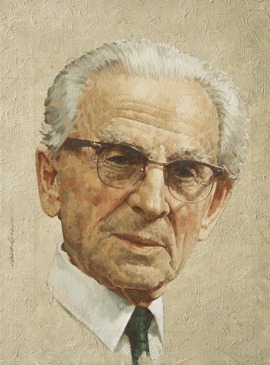 I here have the impertinence to place alongside it my Portrait of Dr. Donald Ferguson (of the University of Minnesota). What is the inference that we are to draw from Mould's observation regarding portraits that do not scare the grandchildren? 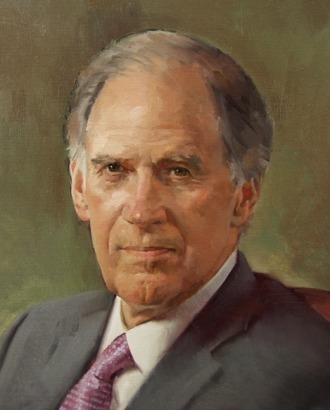 Is it that we are to admire portraits that will scare them, or at least make them uneasy? Mould will have to acknowledge that Picasso's Self-Portrait makes the Gainsborough look vapid, and mine positively irrelevant. But I have noted, over the decades of my own professional practice, that even the most sophisticated collector, surrounded by only the avante-garde, when commissioning a portrait of his wife, will select an artist with traditional skills. The viewer, studying the collection of early English portraits offered for sale by author Mould's own London gallery (including MacPherson's 1758 Portrait of a Nobleman, pictured here) is conscious of the artists' eagerness to present their subjects in the best light possible. 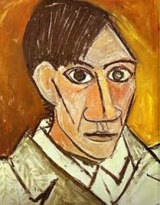 And that is what is normally expected of a portrait artist.